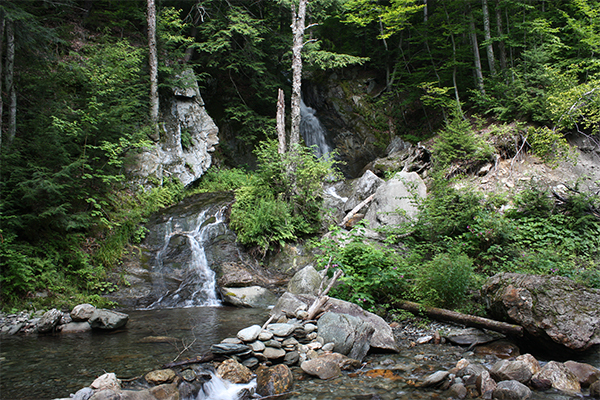 Stetson Hollow Falls is a fine example of the destructive power that Tropical Storm Irene inflicted on Vermont in August of 2011. While hiking an old road to the falls, you will witness huge ruts that were created by runoff in the road as well as various landslides along Stetson Brook, including one directly beside the falls. You'll also see a bridge that was completely removed from its foundation and now sits in pieces with giant fallen trees resting on it. 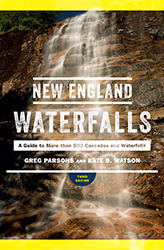 The falls are a 40-foot tall horsetail that tumble down from out of the sky, landing in Stetson Brook in front of your feet. 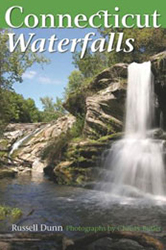 These falls are not well-known; in fact, the name Stetson Hollow Falls is not an official name. 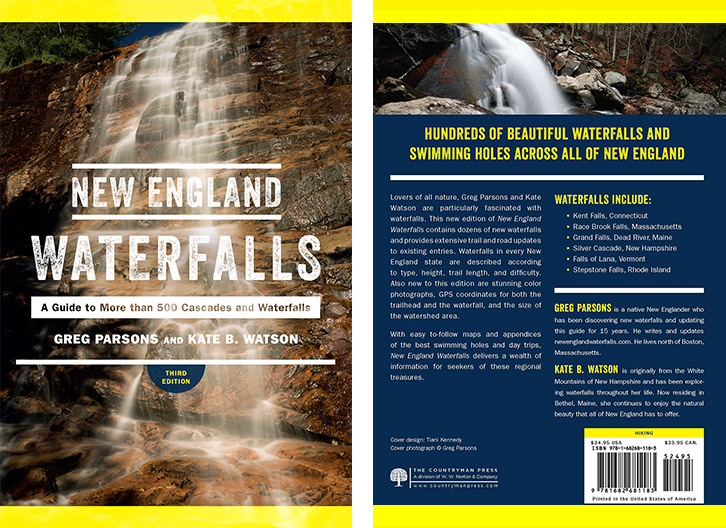 Rather than refer to them as Unnamed Falls, they have been named after Stetson Hollow, of which the forest road passes through. 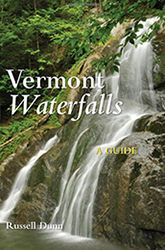 These falls are seasonal, so a trip in May or June is the best time to catch the falls at their finest. Reaching these falls is now a 1.2 mile hike for everyone as high-clearance vehicles can no longer drive further up Stetson Hollow Rd due to poor road conditions. From the parking area, hike west along Stetson Hollow Rd for 0.4 mile. At this point, fork right at a junction and cross a bridge over Stetson Brook. 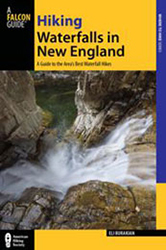 Continue hiking along the old road and you will need to ford Stetson Brook after 1.1 miles. A bridge was previously found here, but it was completely destroyed by Tropical Storm Irene. The brook crossing is typically ankle to shin deep. Other than this somewhat tricky brook crossing, the entire trail to the falls is fairly easy. 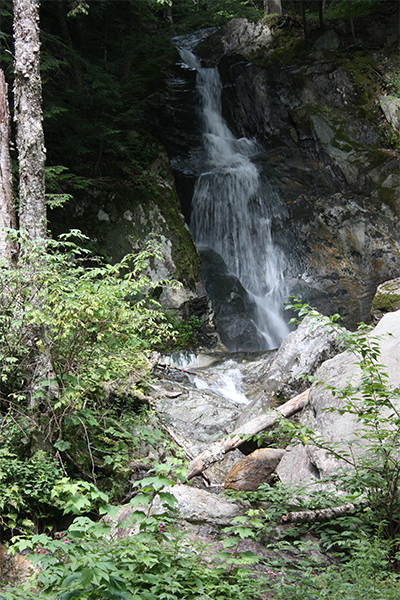 About 0.1 mile beyond the brook crossing, the falls will be visible on your right, seen falling from the mountainside down into Stetson Brook. From the junction of VT 100 and VT 125 in Hancock, take VT 100 north for 12.3 miles through Granville and into Warren. At 12.3 miles, take a left onto Stetson Hollow Rd. Stetson Hollow Rd is also 5.3 miles north of Moss Glen Falls in Granville. If you are traveling south on VT 100 from Waterbury, Stetson Hollow Rd will be on your right 2.1 miles south of Lincoln Gap Rd, which heads west to Lincoln and Bristol. 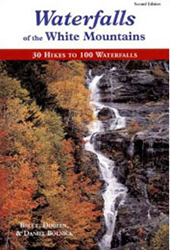 Stetson Hollow Rd is also 1.1 miles south of Warren Falls. You find find two parking areas as you drive west along Stetson Hollow Rd, which is also known as Forest Rd 43. You can either park on the left after 0.1 mile or you can drive a bit further as the road starts to get rougher and park on the right after 0.2 mile. In the past, high-clearance vehicles could drive further up the road but road conditions and a bridge at 0.4 mile have deteriorated significantly since Tropical Storm Irene. To get to Hancock, take exit 3 off I-89 and follow VT 107 east to VT 100 north.